Thornton Wilder’s 1938 classic, directed by James Presson. As the sun sets on Green-Wood’s stunningly unique landscape, you will be immersed in a fresh new take on this American classic, helmed by innovative director James Presson. Presson is a graduate of the theatre programs at Fordham University and Moscow Art Theatre and he serves as the co-Artistic Director of Less Than Rent Theatre, a position he has held since its founding in 2001. He is also the recipient of the 2013/2014 Dramatists Guild Fellowship for the book of his musical, Outlaws. Our Town stars Cory Asinofsky, Mayaa Boateng, Amanda Brooklyn, Ben Diserens, Zoe Farmingdale, Patrick Fleury, Joe Flynn, Yadin Goldman, Rachel B. Joyce, Kumiko Konishi, Roland Lane, Ashley Lanyon, and Jacob Presson. Original music and arrangements by Brendan Fox. Scenic Design by Daniel Geggatt. Costume Design by Sara Donovan. Lighting Design by Jonathan Cottle. Sound Design by Lee Kinney. Puppet Design By AJ Cote. Want more? Stay up late on the weekends for the Our Town AFTER PARTY. 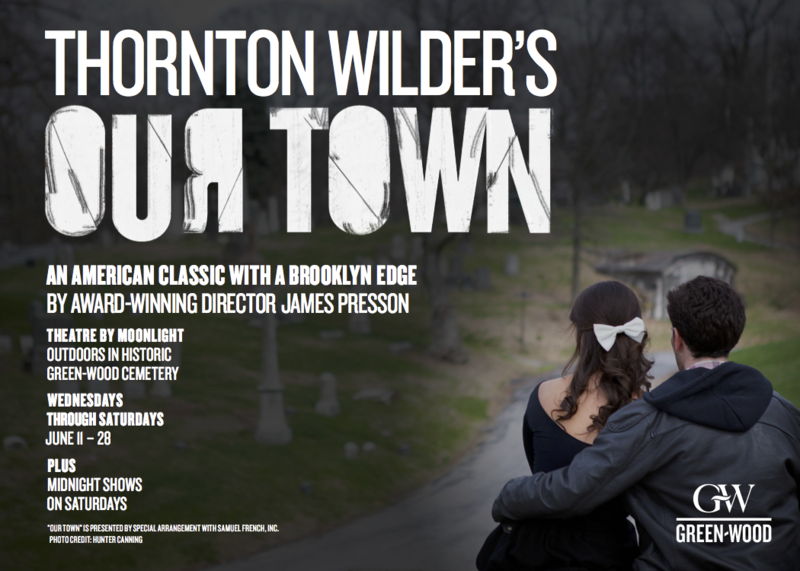 Surrounded by gravesites and night skies, you’ll mingle with the director and the actors of Our Town. The After Party is for all ticketholders of 7:30 p.m. shows on Friday and Saturday and includes a cash bar. And for the true night owl – take in one of our MIDNIGHT SHOWS every Saturday. Arrive at 11:30pm under the cloak of darkness for this special performance. Midnight ticketholders get a voucher for one free drink at the bar – a beer, wine, or Our Town’s specialty cocktail, the Grover’s Coroner. Doors open at 11:00pm. Show begins at 11:30pm. – This show is appropriate for ages 10 and up. – No outside alcohol or food is permitted in the cemetery. – Please arrive at Green-Wood’s main entrance (25th Street and 5th Avenue) at the specified time for your show. – Ticketholders will walk or use the Green-Wood trolley to travel to the show location. – Chairs and benches are provided and all tickets are General Admission tickets. – The performance is two hours and fifteen minutes, with two intermissions. – Flash photography is not permitted during the performance. Don’t know your Member ID number? Not sure which ticket or membership type to order? Call 718-210-3080 or email jconnolly@green-wood.com with any questions.